Create regular pivot tables with just a few lines of R. More complex pivot tables can also be created, e.g. pivot tables with irregular layouts, multiple calculations and/or derived calculations based on multiple data frames. Pivot tables are constructed using R only and can be written to a range of output formats (plain text, 'HTML', 'Latex' and 'Excel'), including with styling/formatting. The pivottabler package enables pivot tables to be created with just a few lines of R.
Provide an easy way of creating pivot tables, without requiring the user to specify low-level layout logic. Provide multiple ways of specifying calculation logic to cover both simple and more sophisticated requirements. Provide styling options so the pivot tables can be themed/branded as needed. All calculations for the pivot tables take place inside R, enabling the use of a wide-range of R functions in the calculation logic. Pivot tables are rendered as htmlwidgets, Latex or plain text. The HTML/Latex/text can be exported for use outside of R.
Pivot tables can be converted to a standard R matrix or data frame. Pivot tables can be exported to Excel. Pivot tables can also be converted to a basictabler table for further manipulation. pivottabler is a companion package to the basictabler package. pivottabler is focussed on generating pivot tables and can aggregate data. basictabler does not aggregate data but offers more control of table structure. pivottabler has many styling and formatting capabilities when rendering pivot tables in HTML / as htmlwidgets using pt$renderPivot(), however the most basic output is simply as plain text. 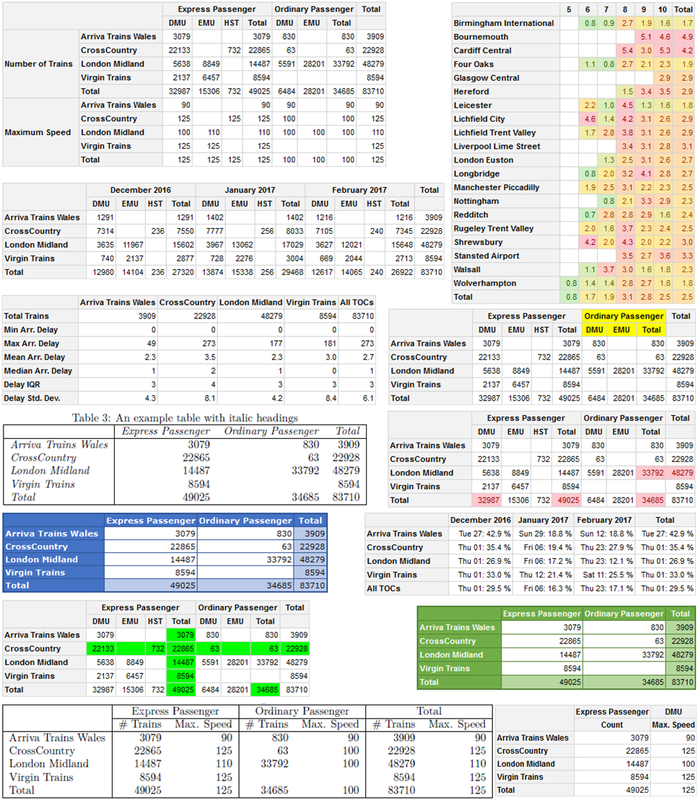 pt$addData(bhmtrains) # bhmtrains is a data frame with columns TrainCategory, TOC, etc. Multiple calculations are supported. Calculations can be based on other calculations in the pivot table. Calculations can be hidden - e.g. to hide calculations that only exist to provide values to other calculations. It is also possible to change the axis (rows or columns) and level in which the calculations appear. See the "Calculations" vignette for details. More advanced calculations such as % of row total, cumulative sums, etc are possible. See the "A2. Appendix: Calculations" vignette for details. Styling can be specified when creating the pivot table. The example below shows specifying styling using a quick-pivot function and using the more verbose syntax. It is also possible to change the styling of single cells and ranges of cells after the pivot table has been created. See the "Styling" and "Finding and Formatting" vignettes for more details. The same styling/formatting used for the HTML output is also used when outputting to Excel - greatly reducing the amount of script that needs to be written to create Excel output. In the screenshot above, Gridlines have been made invisible to make the styling easier to see (by clearing the checkbox on the 'View' ribbon). Columns were also auto-sized - though the widths of columns could also be manually specified from R. See the Excel Export vignette for more details. This version of pivottabler generates slightly different CSS/HTML for the built-in themes/styling compared to previous versions. The visual appearance is unchanged. This may be a breaking change for users who require the generated CSS/HTML code to be identical to previous versions. In version 1.0.0 and earlier versions of pivottabler, the built-in themes used a shared set of style declarations for both calculation value cells and total cells. From pivottabler version 1.1.0 onwards, total cells use a separate set of style declarations. The visual appearance of pivot tables using the built-in themes has not changed, only the HTML/CSS that is generated is slightly different - so the great majority of users will not be affected. This change reduces the risk of styling changes to totals accidentally affecting all calculation value cells and vice-versa. The output of earlier versions, where total cells and calculation value cells use a shared set of style declarations, can be generated by specifying compatibility=list(totalStyleIsCellStyle=TRUE) as an argument when creating the pivot table, either in PivotTable$new() or one of the quick pivot functions such as qpvt(). Convert a pivot table to a basictabler table - enabling flexible/arbitrary changes to be made to pivot tables after they have been created, e.g. inserting or deleting rows/columns/cells. See the "Outputs" vignette for more details. New function pt$setStyling() simplifies the setting of formatting and styling on data groups and table cells. See the "Styling" vignette for details. Specifying styling/formatting when creating pivot tables using the qpvt() and qhpvt() functions is now possible. See the "Introduction" vignette for a list of parameters for these functions. See the "Styling" vignette for more examples. Specifying styling/formatting when creating pivot tables using the verbose syntax is also now possible - styling can be specified when adding data groups and when adding calculations to pivot tables. Again, see the "Styling" vignette for more details and examples. A more detailed explanation of styling rules has been added to the "Styling" vignette. The default value of the specifyCellsAsList argument in the pt$getCells() function has been changed to TRUE. The previous usage of the pt$getCells() function is still supported (now you must explicitly specify specifyCellsAsList=FALSE). This change has been planned since v0.3.0 (June 2017) and a warning message has been displayed since then. See the Finding and Formatting vignette for more details on the specifyCellsAsList argument. Additional checks are now made to prevent calculations being moved/added after the calculation row/column groups have been generated. There is a small chance this will cause errors in existing user code - though this will only occur where user code is trying to move/add calculations after the calculations have already been set in the pivot table by a call to pt$addColumnCalculationGroups() or pt$addRowCalculationGroups() (previously this would silently fail). pivottabler now supports using any of the following data types in both row/column headings and cell values: integer, numeric, character, logical, Date, and POSIXct. Improved support for illegal data frame column names and illegal calculation names (e.g. including spaces or symbols such as dash, plus, dollar, etc). See the Details Appendix (A1) vignette for details. The new PivotFiltersOverrides class provides many new options for overriding the data used to calculate cell values. It is now possible to add to, remove from or entirely replace filter criteria as part of calculation definitions. This makes calculations such as "% of row/column/grand total", ratios/multiples, rolling averages and cumulative sums easier. See the Calculations Appendix (A2) vignette for examples. Row/column heading style settings for data groups can now be declared up-front using the baseStyleName and styleDeclarations arguments in pt$addColumnDataGroups(...) and pt$addRowDataGroups(...). See the Styling vignette for an example. Row/column heading style settings for calculations can now be declared up-front using the headingBaseStyleName and headingStyleDeclarations arguments in pt$defineCalculation(...). See the Styling vignette for an example. Cell style settings for calculations can now be declared up-front using the cellBaseStyleName and cellStyleDeclarations arguments in pt$defineCalculation(...). See the Styling vignette for an example. Additional exportOptions parameter when exporting to HTML, Latex and Excel for controlling how NA, NaN, -Inf and Inf are exported. See the Details Appendix (A1) for more information. Additional parameter outputHeadingsAs in pt$writeToExcelWorksheet(...) to control how row/column headings are formatted when exporting to Excel. 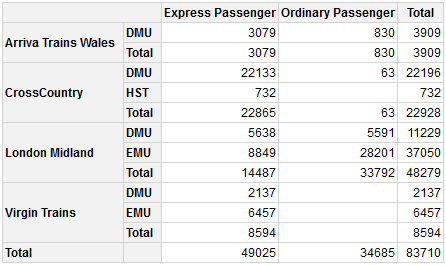 See the Excel Export vignette for more details. pt$asDataFrame(...) and pt$asTidyDataFrame(...) now support additional parameter stringsAsFactors with default value default.stringsAsFactors(). Bug fixed that would cause corrupt Excel files to be generated when exporting pivottables with no row/column groups to Excel. No breaking changes currently planned. Removed support for R 3.2.x. Minimum supported version of base R now R 3.3.0. It is now possible to output a pivot table to an Excel file with one line of R, including with styling that closely matches the HTML output. 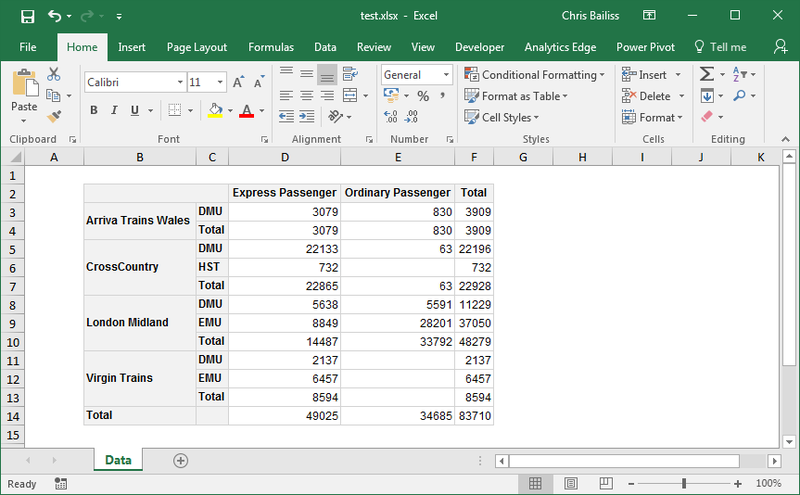 See the Excel Export vignette for more details. Quick-pivot functions now support showing/hiding totals and renaming the captions of totals, which was previously only possible using the verbose syntax. See the Introduction vignette for more details. Corrections to ordering of code in Styling vignette. A couple of other small bug fixes. The previous usage of the arguments for the getCells() function is still supported (and is still the default) however the new argument usage will be made the default in a future version. For now, a message is displayed noting the upcoming change. See the Finding and Formatting vignette for more details. Pivot table initialiser parameters renamed from messages and messageFile to traceEnabled and traceFile respectively. pivottabler now calculates cell values in batches in order to reduce the calculation time required for larger data frames. For large pivot tables based on large data frames this typically results in a big performance improvement, e.g. for a pivot table of 1000 cells based on a data frame with 10 million rows the rendering time is around 7 seconds in version 0.3.0 compared to over 480 seconds in version 0.2.0. See the new Performance vignette for more details. pivottabler now also supports the data.table package for performing pivot table summary/aggregation calculations. dplyr remains the default however data.table offers a moderate performance improvement for large data frames (10 million rows and above). See the Calculations vignette for more details. addRowDataGroups and addColumnDataGroups functions pre-group the data to reduce the time required for larger data frames. New argumentCheckMode parameter added to pivot table initialiser to provide an additional option to reduce the time required to create larger pivot tables. print() method added to PivotTable class. Can now print a simple plain text view of the pivot table to the console using just pt or retrieve the plain text as a character value using pt$asCharacter. Quick-pivot functions added that construct a basic pivot table with one line of R: qpvt(), qhpvt() and qlpvt(). See the Introduction vignette for more details. Internal pivot filters class differentiates more clearly between 'all', 'some' and 'none' match cases for more robust filtering and early elimination of some cell calculations. The getCells() function has been made more intuitive to use when getting specific cells by using a new cellCoordinates argument. See the Finding and Formatting vignette for details. Stricter name checking for calculation names to avoid later unclear dplyr/data.table errors caused by syntax errors arising from illegal names. Added the ability to output a pivot table in Latex. Added the asMatrix() function to allow the pivot table contents to be retrieved as a matrix. Added the asDataFrame() and asTidyDataFrame() functions to allow the pivot table contents to be retrieved as a data frame. Added findRowDataGroups() and findColumnDataGroups() functions to find data groups (i.e. headings) that match specified criteria to simplify scenarios such as changing the styling of specific headings. Added the getCells() function to retrieve cells by row number and/or column number. Added the findCells() function to find cells in the body of a pivot table that match specified criteria to simplify scenarios such as conditional formatting. Five new vignettes added. Many changes to the existing vignettes. Modified the sample data by specifying a time zone (UTC) for all POSIXct data to remove inconsistencies when using the data in different time zones. Modified the automated tests to no longer use the digest package. Updated object documentation to wrap lines longer than 80 characters. Shiny vignette examples now working. No versions prior to 0.1.0 were released.